Sometimes, I just wake up and decide today is the day to start a new renovation, despite the fact we already have two in-process. Last summer right after we moved in, we tackled painting our kitchen cabinets, installing new cabinet hardware, tearing out the trim, started to put up new trim, ripped out a few cabinets, installed some open shelving and then collapsed in exhaustion because it was so much more time consuming than we realized. That was Phase I, and we kind of assumed that Phase II would take place in a few years. 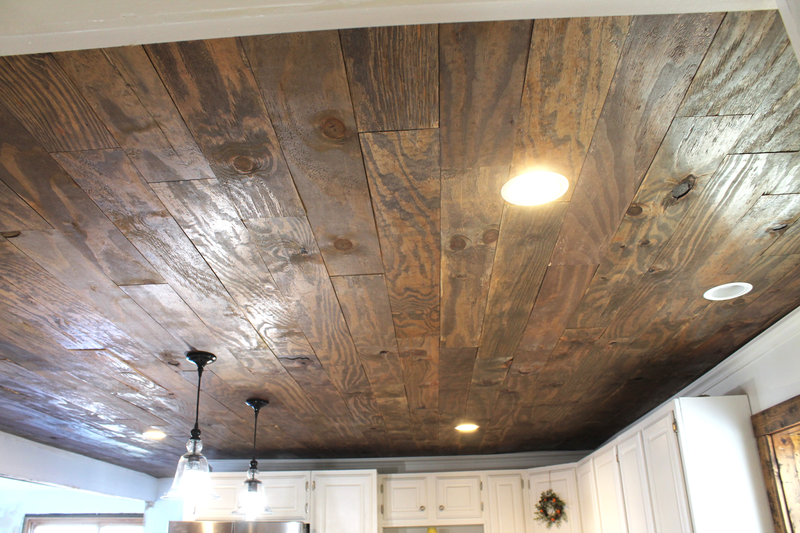 But, I just got the itch to make a quick update to our kitchen ceiling, and one thing lead to another, which snowballed into a pretty big project or three. So once our cabinets were painted, they really clashed with the oak ceiling, trim and doors. Also, I really didn't like the generic tile-style ceiling, and started to brainstorm quick fixes because you know, we hadn't yet finished our laundry room, and our new bathroom installation was also half-ish done, and I didn't want to add to the pile by introducing an other extensive project. So I came up with the idea to glue beadboard to each of the ceiling tiles, and paint the beams white. It was something I could live with for at least five years. 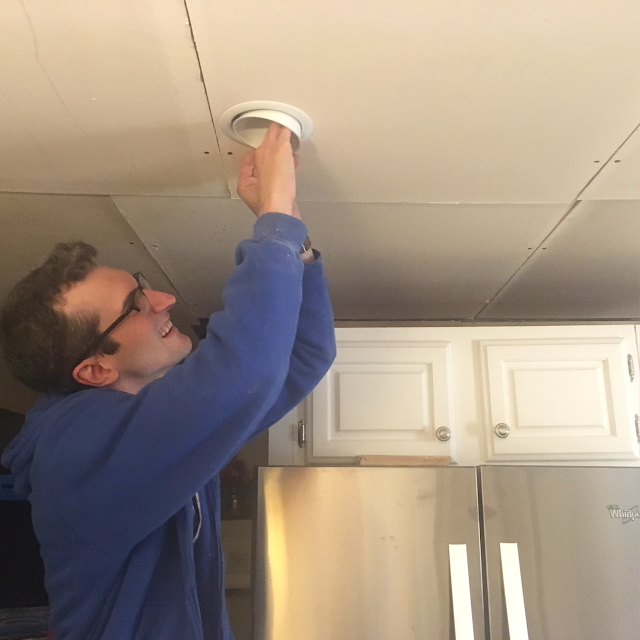 But then Josh looked at me and said, "Is that the ceiling you want forever, because it'll still be a lot of work," to which I replied, "Mmmmmm no." So then Josh started to lift up the ceiling tiles, poked around up there for a while and after a bit of back and forth discussion, we decided to tear it down. "Are we seriously tearing down this ceiling?" we kept saying. Yeah, we were tearing down our ceiling! So, the following Sunday, we did. Side note: I did not participate in the actual tearing down because we have an old house, and tons of mouse poop fell down. I can't handle mouse poop, so I left and came back to sanitize everything once Josh was done. But let's rewind a bit to what our kitchen looked like when we moved in, and what it looks like now. Here's what our kitchen ceiling looked like when we moved in (ignore the white paint, I was testing something out). 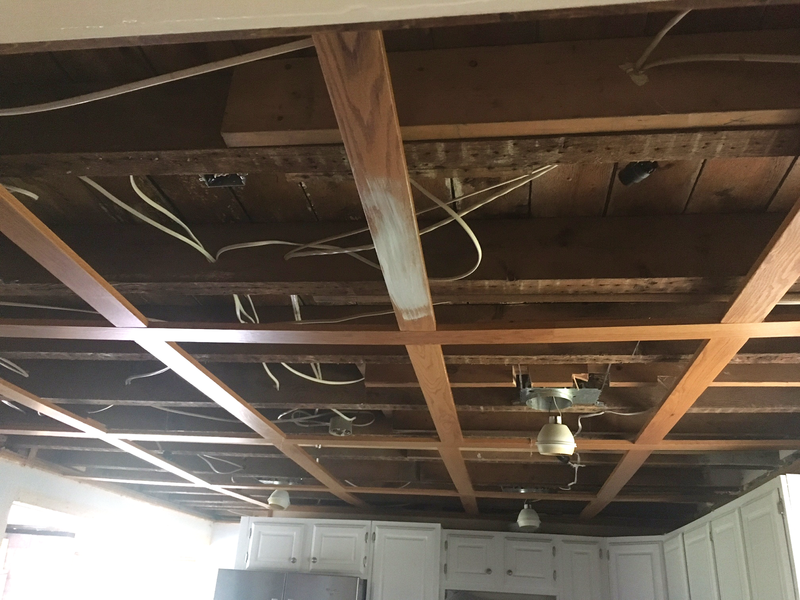 The original ceiling trim was really uneven, patchy and just needed to be ripped out. Once the ceiling was completely torn down, Josh noticed that (of course) the electrical wasn't up to code. So we had to call our contractor to come over and fix it. Once he was here, I believe his exact words were, "They did it illegally, poorly and more expensively than if they had done it correctly." Greeeeaaaattttt. But, he fixed it right up for us, and we were ready to install the drywall. 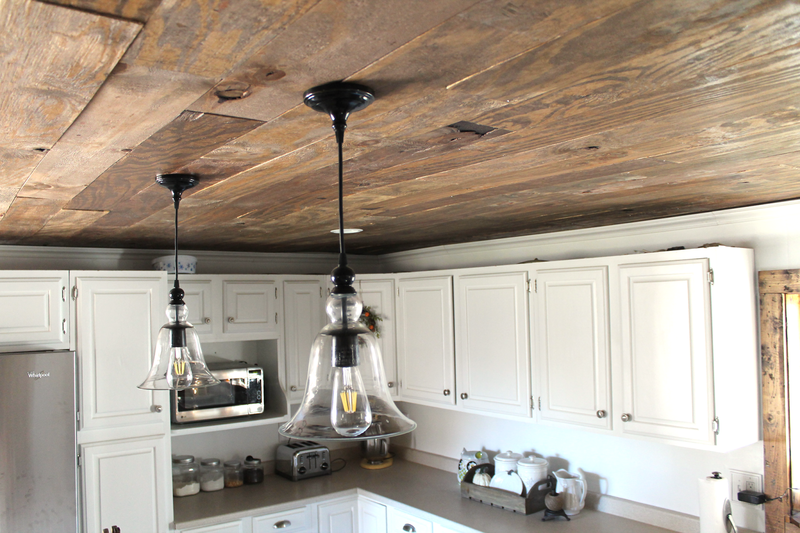 The existing ceiling tiles were drywall pieces that created a drop ceiling, and they were held up by some oak 1x4's. 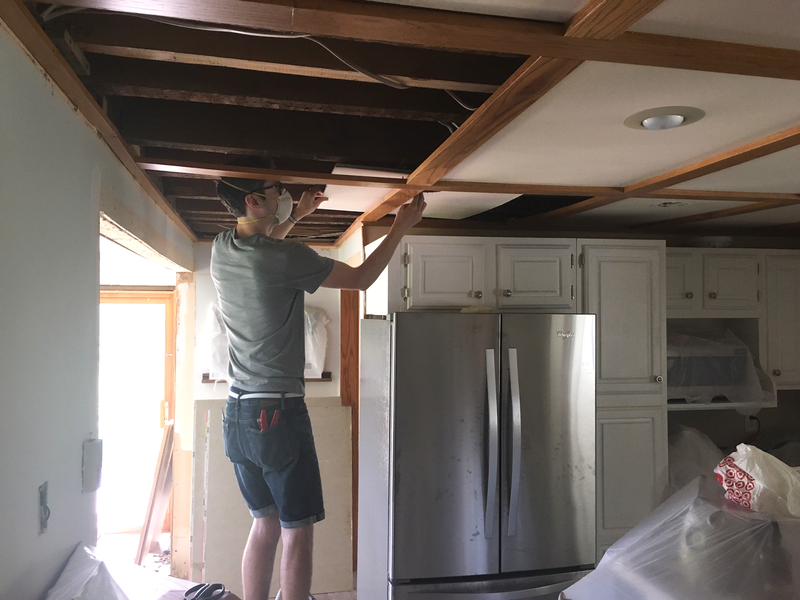 We decided to recycle the existing drywall to create the actual new ceiling structure, and screwed them into the joists to secure then in place. We sealed all the seams with joint compound (because you know, mouse poo), but thankfully, we didn't need to tape or sand because of what we decided to put over the drywall. Once that was done, Josh had to install some shims to level the drywall because our joists were definitely uneven. 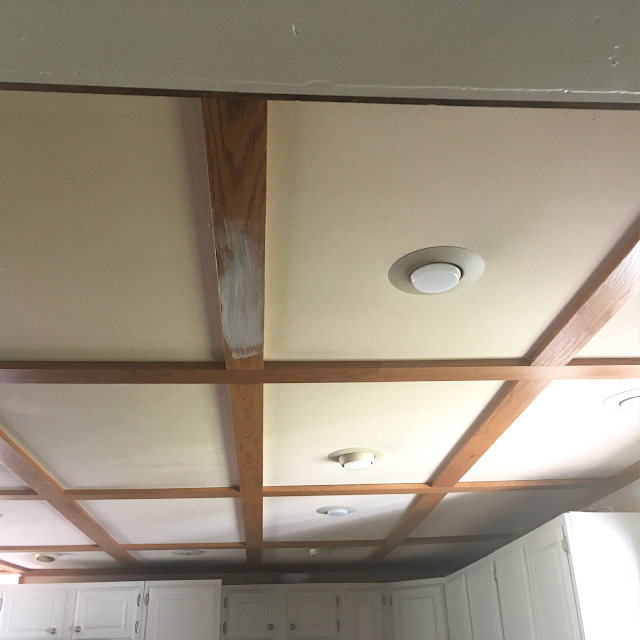 After that, he filled in the gaps with a skim coat of joint compound, and then we were ready to install the ceiling we wanted for the long-haul. 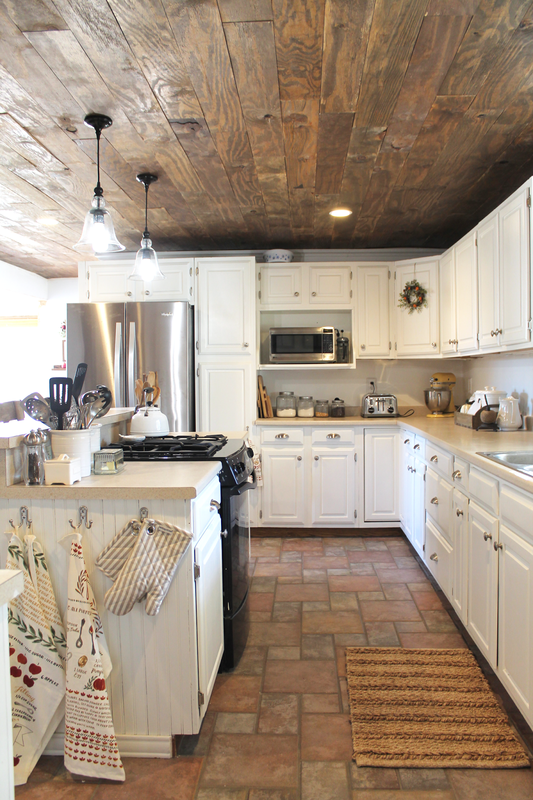 Since walking into this kitchen for the first time, I just always saw a wood-planked ceiling. I'm not really sure why, but it spoke to me, and I just went with it. And this is where we made our first ever costly mistake. We didn't want to buy really thick wood for this project to make installation easier. I also wasn't thrilled with the quality of the Armstrong ceiling planks we used in our bedroom (they look great, but installation was a pain because they were pretty flimsy). So, we decided to use plywood. And we had miscommunication between the two of us, and we bought, and had Home Depot cut up a bunch of plywood, that looked awful. I mean, 70s wood paneling awful. And because we had spent the money, and paid to have them cut for us, I tried to convince myself that they were fine, and I sanded, stained and polyed half of the planks (about 50). Once they were stained, they looked even worse. 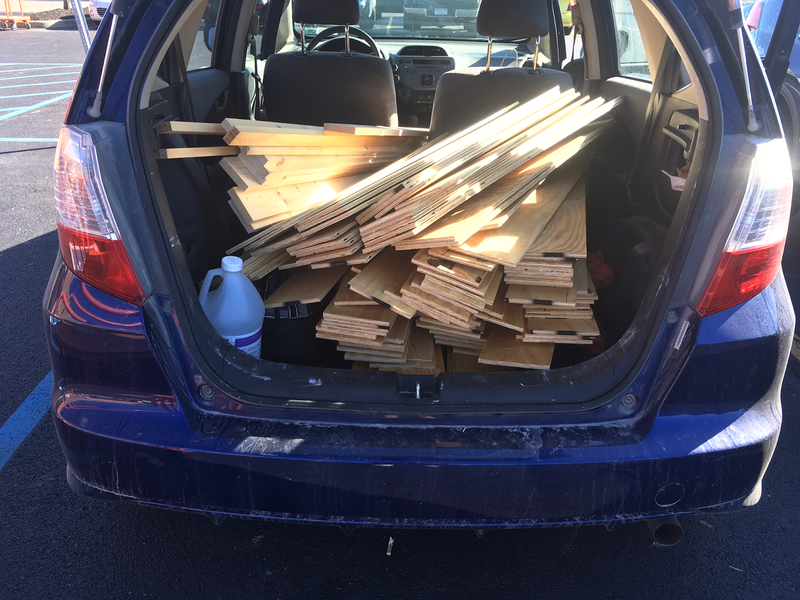 Finally, after a lot of conversation about how much I hated them, we decided to just eat the cost, and go buy the right kind of plywood and do it up right. So, back to Home Depot we went. And honestly, this was such a good decision because the difference between the two was night and day (in my eyes). 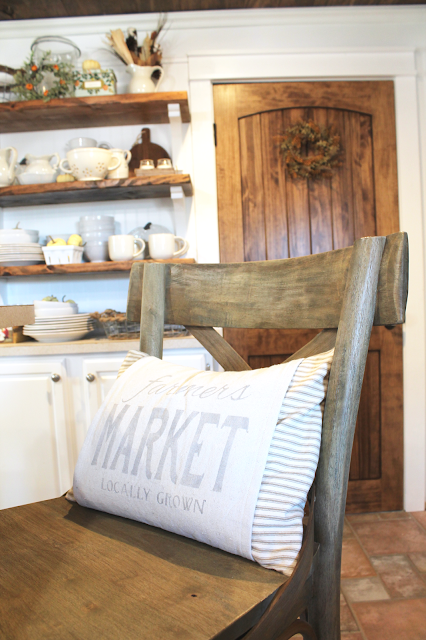 The original planks we bought were over $100, plus all the time it took me to stain them. In the grand scheme of things, it's nothing, but since it was the first time we screwed up something that we couldn't return, it was kind of a disappointing blow. I really wanted the ceiling to look reclaimed and old, and we were able to find something that gave that look. So off I went (again) to stain and poly 100 planks. It was torture, but I survived. It's so much easier to stain before installation because stain is so messy. We nailed them into place, installed some crown molding and the ceiling was complete! See all these planks? I had to stain them. And poly them. It.was.torture. For lighting, we removed a few of the existing recessed lights so we could add some pendants over the island. 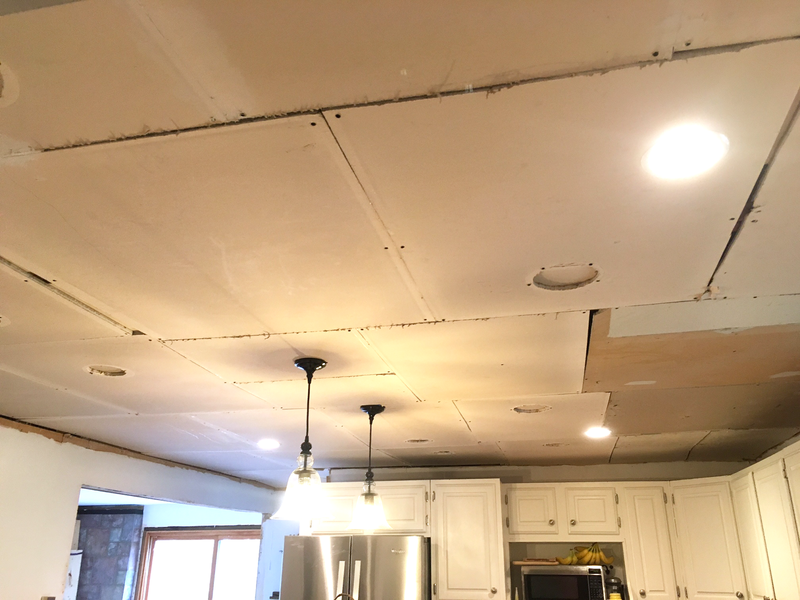 For the remaining recessed lights we did keep, we updated them with a baffle style in a crisp white, and aligned them so they were more symmetrical around the room. Just replacing the older, dingy, mis-matched creamy yellow recessed lights with nice new white ones made a huge difference. Plus, installing them with some kind of symmetry, versus having them randomly all over the kitchen, felt so much better. 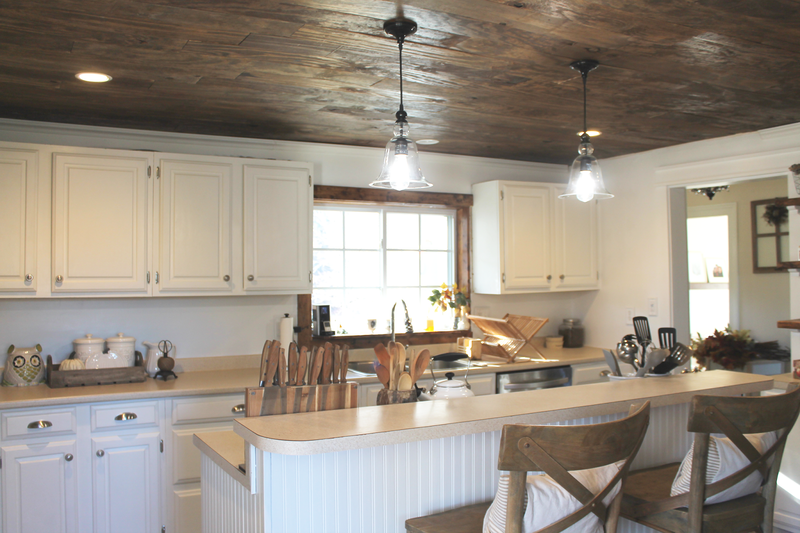 I was originally thinking we'd do very stylized farmhouse pendants above the island that were either caged or more industrial - like a brushed nickel or something. But in the end, because of the planked ceiling, I really liked the simple, non-obtrusive glass and bell shape of the ones we got, which had soft lines that kind of contradicted the linear planks in a nice way. I probably overthought this decision, but that's how I do things, and I'm thrilled with how they look. Our ceilings in this area of the house are really low - like under 8 feet, so they don't have a super long drop, but I think they still work. 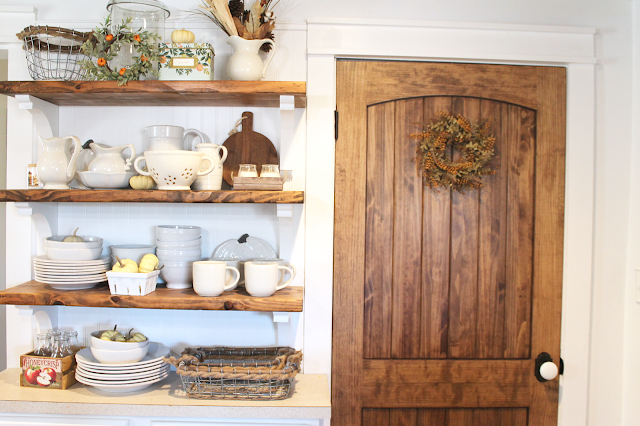 Last year, with the help of some family, we ripped out some of our cabinets to replace them with open shelving. 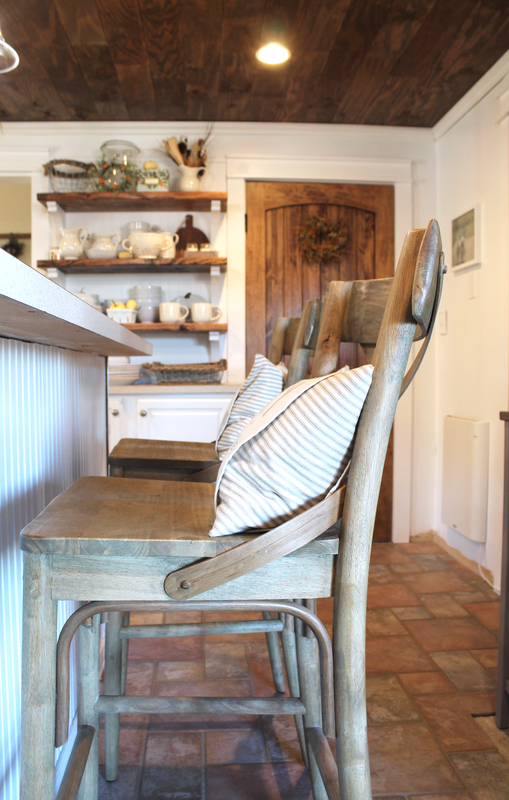 While I loved this little corner of our kitchen, and I was so proud of it because it was one of the first projects we did, my experience over the past year or so has opened up my eyes to different things and I had a new vision for this little nook. 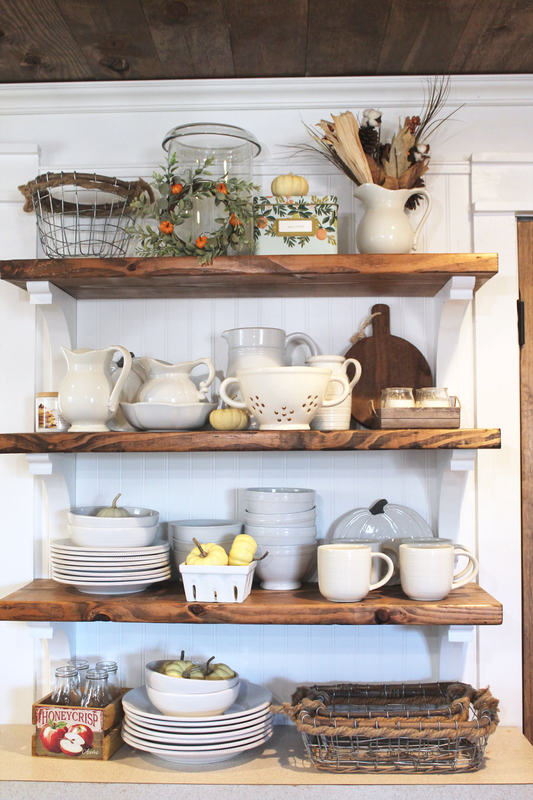 We replaced the corbels with some larger and sturdier ones, which also allowed us to only install two, instead of three, per shelf (allowing more storage space underneath). And we upgraded the shelves to thicker ones, and rather than painting them white, I stained them the trim and ceiling color. I love this new update. Like, seriously love it. I used to love bright colors in our kitchen, and used this area to display all our colorful mugs, but I've since started to adapt a more neutral color palette. So, I put all our neutral and white dinnerware out, and put our colorful coffee and tea mugs back into hiding. My whole body felt so much more at ease when I did that. In order to remove the old trim and install new pieces, we had to remove the entire cabinet. Fun times! 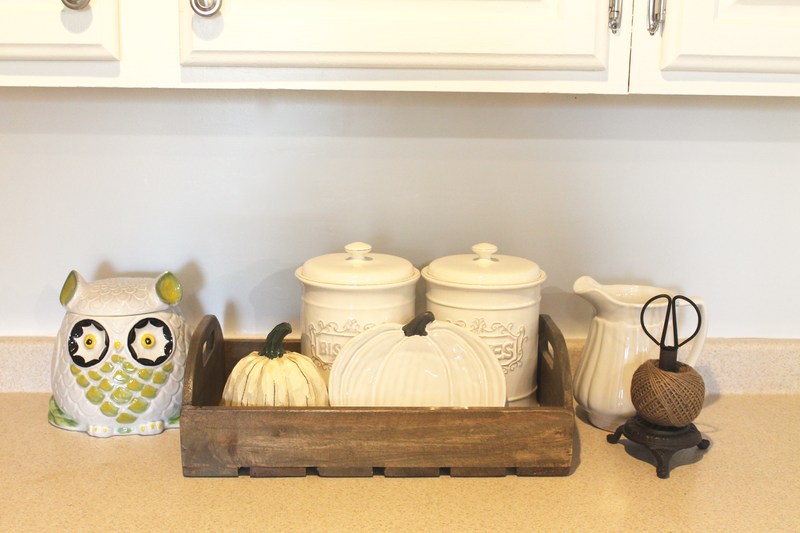 Removing the backsplash also gave me life! The countertops aren't bad - I'm just itching for a nice white quartz because the warm-pinky tones in our existing counters are clashing with our crisp white everything. Dramatic sigh, sometimes it's hard to see colors with so much specificity. 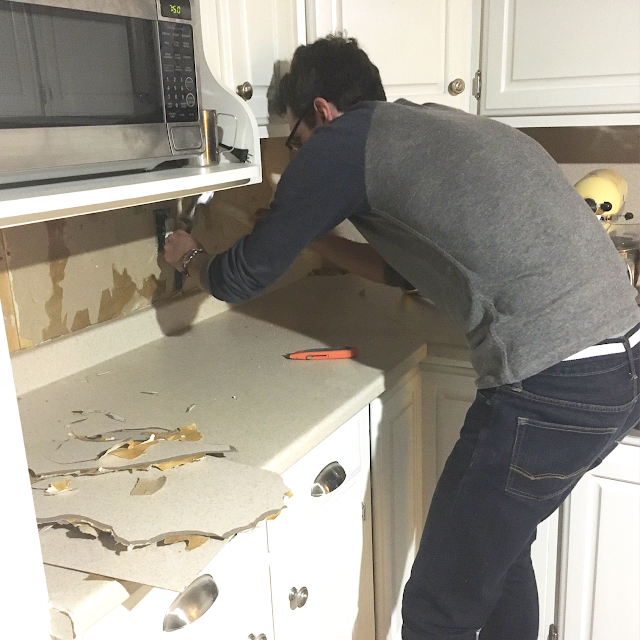 I also wanted our countertop accessories and gadgets to stand out a lot more, so we started to rip out the backsplash one night, literally on a whim. 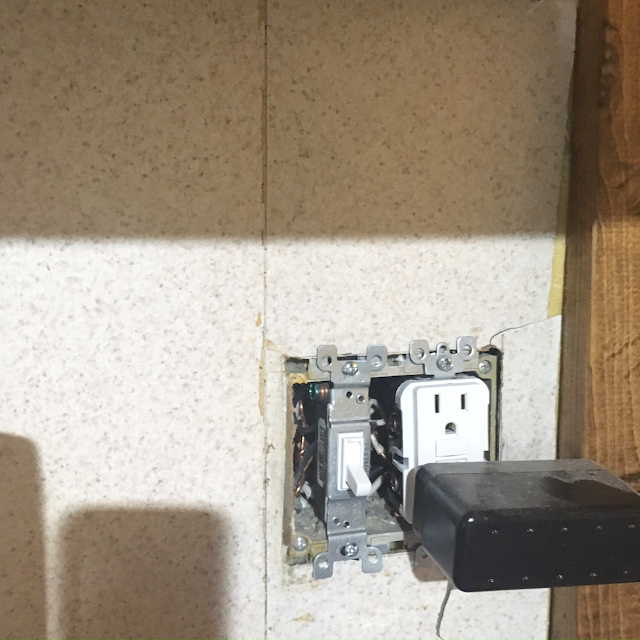 We quickly realized it would be easy enough to repair the drywall underneath, so we just started to do that, too. You know, since we were putting in a new ceiling anyway, we may as well do this, too! Because the adhesive tore up the drywall, Josh just skimmed the surface with some joint compound, sanded it down, and it was ready to prime and paint. It was a pretty easy project that made a huge difference. The existing backsplash was in pretty rough shape - so many seams, cracking and a lot of adhesive staining. and made me realize how great it'll be once we have white counters. I also totally repainted all the walls - even though I just painted them a year ago. 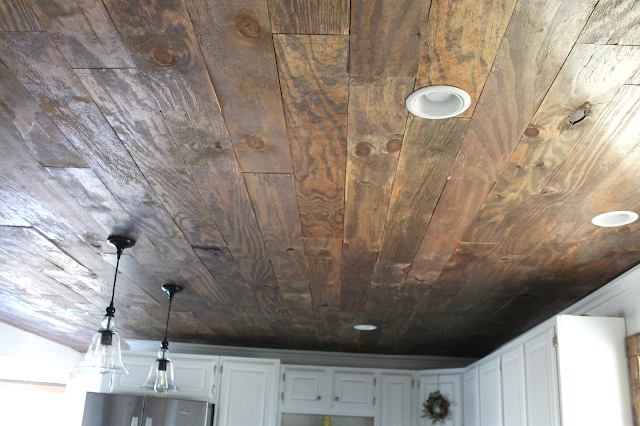 With the wood plank ceiling being darker than the existing ceiling before, and the fact that our kitchen doesn't get a lot of natural light, I just thought it would be better to have the walls the same white as the cabinets. And thankfully, I was right. The very, very light gray we had before would have totally worked, but the white added a crispness to the room that nothing else would have added. Totally worth it because it added so much brightness. We also updated the trim for the doorways. Last fall, I started to rip out the oak trim and install a faux reclaimed wood trim around one door as a test. I loved it. 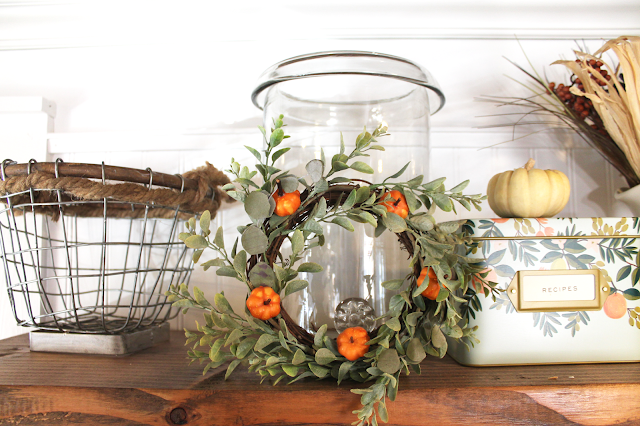 Like, seriously loved it, and extended it to our kitchen sink window, as well as our dining room, and planned to also install it around all the doorways in our kitchen. But, once the walls were painted white, and the new open shelving and ceiling were installed with their reclaimed wood aesthetic, I thought the same style doorway trim would be too much for the eye. So, we took down the test doorway we did, put it aside for the dining room, and cut and installed a farmhouse-style trim in white. I'm so pleased with this decision. 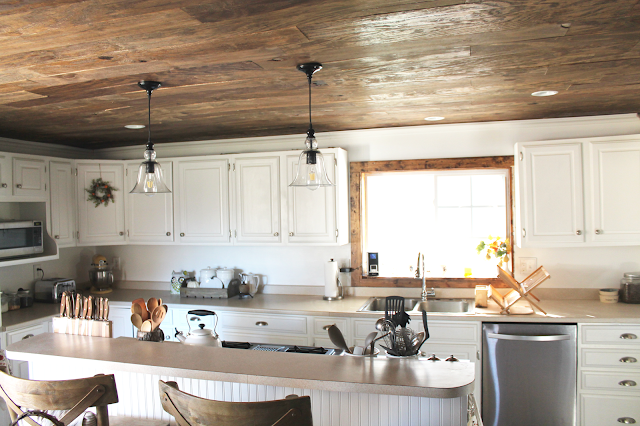 It's gives a lot more balance to the room, and leaving the "reclaimed" wood trim around the sink window makes it a little more special. Finally, we replaced the doors that lead to our half bath and pantry. 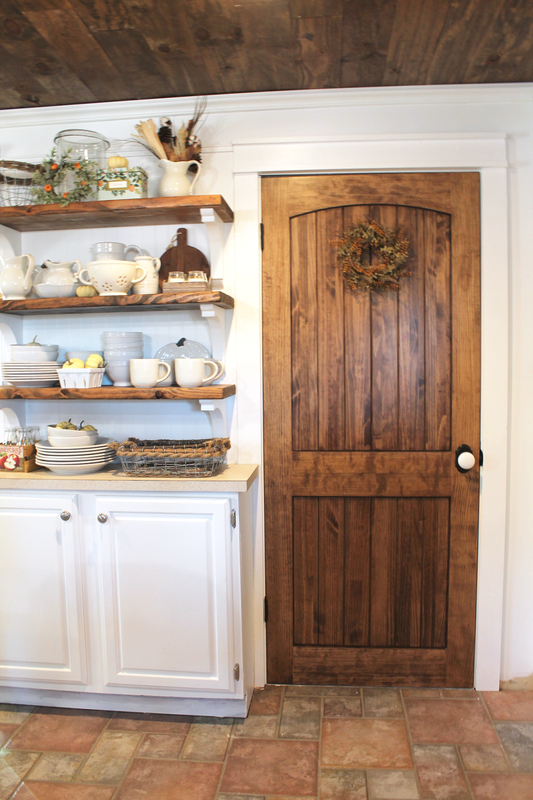 This was especially exciting for me because it was the last of the oak to go in this space, and getting up new doors made all the difference. 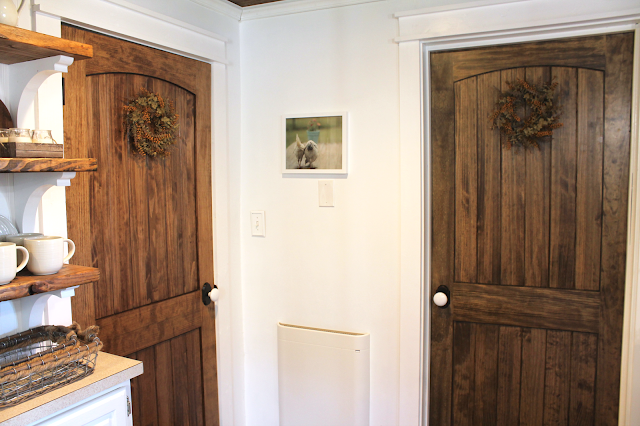 We bought slab doors, drilled holes for the knobs, and I opted to stain them the same color as the ceiling and shelving. We debated a lot between painting them white and staining them, but something in my gut just wanted to stain them. So we did. And it was totally the the right call. 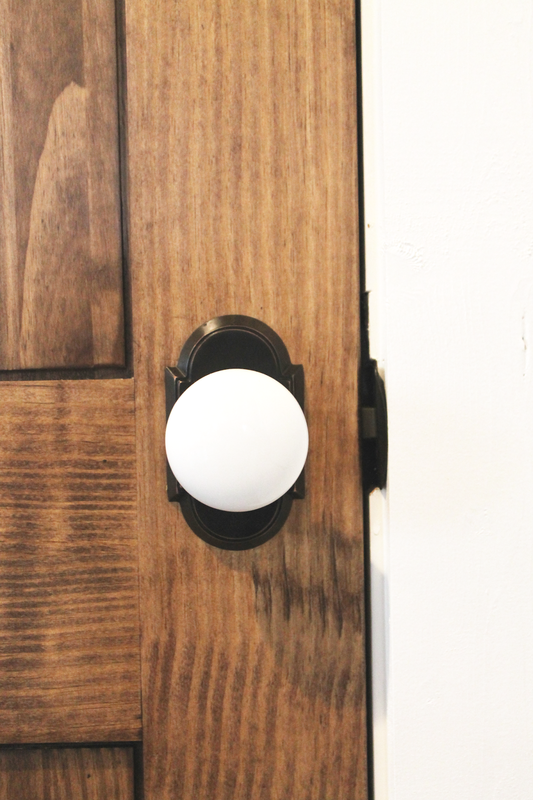 We used bronze hardware (even though our cabinet hardware is satin nickel - I'm a rule-breaker), and added porcelain door knobs. 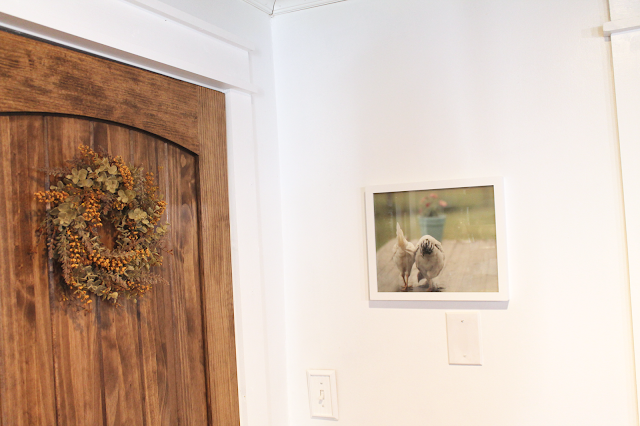 I found these amazing natural-looking wreaths on Etsy and immediately pictured them on our kitchen doors, and I love how they added a little sprinkle of texture to the room. Kitchen before we ripped this top cabinet out. And after with a new door and open shelving. Several months ago we invested in some barstools for our island. When one of us was cooking, the other didn't have any place to sit down, so these were one of the best purchases we've ever made. I also got these little pillows from PeekPillowOriginals on Etsy to add a little coziness. You can see in the corner that we still have to install some floor trim, but that'll be fast and easy. Then, we looked around and had an entirely new kitchen. I couldn't believe it, especially because deciding to tackle all these things was so spur-of-the-moment. 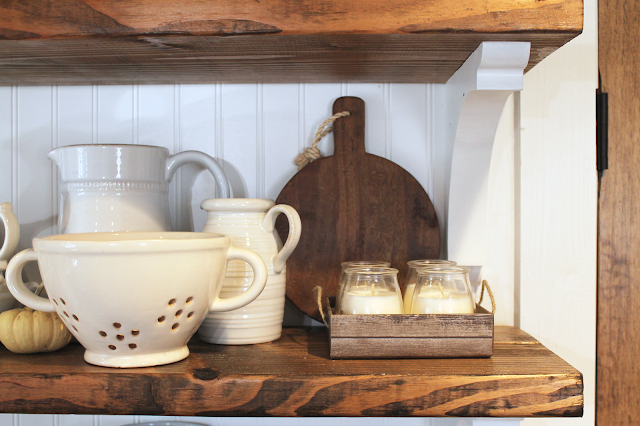 Now that we're getting closer to the holiday season again, I'm starting to want to build my little winter nest, and since we spend so much time in the kitchen, having this area of the house further along than we anticipated feels incredible. The next phase of the kitchen will be to install open shelving on the wall opposite the window above the sink, which I conveniently left out of the photos because it's half done and looks awful. It entails grouting and patching up part of our slate floor as well as installing more beadboard and open shelves. That will probably happen sometime this winter. 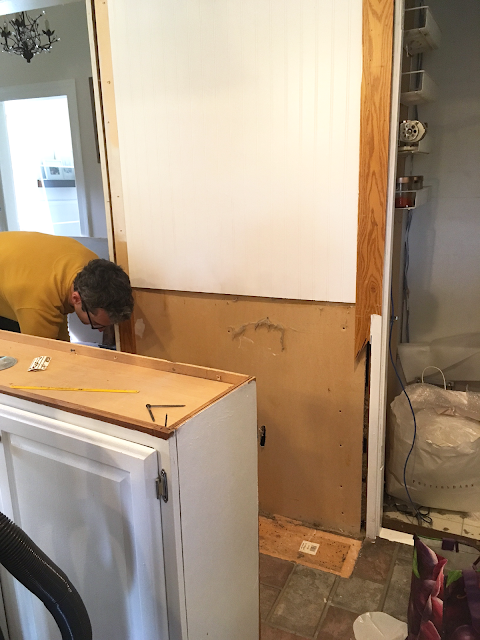 Down the line, we plan to install white quartz countertops, a white subway tile backsplash, a white apron-front sink and the Kohler faucet. That will probably be another five years or so, and then our kitchen will be totally complete. But for now, I'm beyond thrilled with what we've done. This is probably the best little side project we've ever completed.